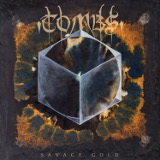 Tombs releases their third LP with Savage Gold, a post-black metal album that is a step away from the more atmospheric sounds of bands I've heard labeled "post-black metal". I always (unfairly) imagine that vague genre as as blackened-but-sensitive music, perhaps something like a Fen album. But while Tombs' roots are definitely blackened and gnarled, the listener will wait in vain for any sensitivity to be found in this album, and the cleverly constructed songs are never anything but heavy. Thanatos, starting with an ominous-sounding organ, has the essence of black metal in its repetitive, squealing guitar riffs, but the production mixes in Andrew Hernandez's drums well enough to make them more than the lo-fi sound of a garbage can beaten with a stick that so many black metal bands still adhere to, and Ben Brand, on bass, plays his own melody underneath the guitars. The punk flavor that the band is known for can be felt on Portraits, but perhaps as more of a Killing Joke vibe taken to its logical extreme than the traditional idea of a punk band. Every so often the drums and bass stop and the guitars hush as they play a new theme, quiet in volume, but noisy in tone, but most songs sooner or later fall back on almost pure black metal themes, with a sharply penetrating lead soaring over the rest of the band and leading the harshly minor-key melody. Echoes is deep and sludgy after the initially clean vocals, though it keeps the blade-sharp lead guitars and those little hushes in between theme changes within the song. Deathtripper is a strange aside from Tombs' usual sound; it's a slow, mostly bass-driven piece where the guitars act only as leads playing the same riff over and over, while the distorted vocals chant a hypnotic paen of misery and depression over and over; the effect is dark and mechanized with the sound of an industrial track. Though a whole album of this kind of thing would probably be pretty painful, I liked it as a one-time thing, a break from the other, heavier tracks -- and, for the same reason, Severed Lives, a sullen, ringing tune with dull but clean vocals. Edge of Darkness, with its thrashy intro, is also one that can capture interest. Overall this is a fairly good album, though I found myself liking the few and far between but quieter songs, where the band pushes the boundaries of what they can do with their sound, better than the more recognizably black-metal pieces. At the least, this stands on its own as an excellent black metal album, and the non-black-metal touches they put in most of their songs make them that much better.